This paper analyses the debate which has unfolded in the Baltic Sea Region regarding the reduction of sulphur content in vessel fuels, in order to illustrate how tightening environmental regulation challenges traditional forms of maritime governance. Using an interactive governance approach, this study reconstructs the process of sulphur emission reduction as a complex multi-stakeholder interaction in multiple contexts. The empirical investigation has drawn on documentary material from around the Baltic region, including Russia, and has applied the method of qualitative content analysis. The empirical study focuses on two interlinked questions: (1) How sulphur emission reduction policies are being anticipated by maritime industry, in particular by Baltic ports and (2) How port adaptation strategies are tied into Baltic local and energy contexts. Addressing these questions highlights the role of polycentricity in shipping governance and explains how the same universal international regulations can produce varying patterns of governance. The paper concludes that policy-making shall take an account of the fact that the globalized shipping industry is nevertheless locally and sectorally embedded. Environmental concerns have a growing strategic importance for maritime transport and ports (Darbra et al. 2009; Hall and Jacobs 2010). Even though shipping is a late-comer in environmental matters compared to many other industries, the tightening regulation and pressures from the end customers to diminish the environmental burden of the entire transport chain have changed the mind-set of the maritime transport sector (Lai et al. 2011). This paper focuses on air emissions of shipping, in particular the debate regarding reducing the sulphur content in vessel fuels to illustrate how tightening environmental regulation challenges traditional maritime governance forms. Even though vessels’ air emissions are not the only negative environmental externality of commercial shipping, the rising energy costs, the need to cut harmful emissions to the environment and to increase the energy efficiency of the vessels has put the air emissions and energy question in the spotlight. The reduction of air emissions from shipping has been a hot topic in the maritime industry for over a decade, but with the entry into force of the amendments to the International Convention for the Prevention of Pollution from Ships (MARPOL) Annex VI “Prevention of Air Pollution from Ships” in 2011, the European Union (EU) Directive 2012/33/EU of 21 November 2012 regulating the sulphur content of marine fuels and the designation of the Baltic and North Sea, as well as the English Channel to Sulphur Emission Control Areas (SECAs), its acuteness has become evident. The debate about controlling vessel emissions reflects a wider shift of power from flag to port states (Roe 2013), the changing role of the ports in global transport and value chains (Olivier and Slack 2006), and political tensions regarding energy security (Aalto 2008). Previous research has addressed the technical side of emission reduction, focusing mainly on vessels (Endresen et al. 2003; Eyring et al. 2005; Corbett et al. 2009; Wahlström et al. 2006; Balland et al. 2013), whereas the socio-political side of emission reduction in shipping, in particular the role and stakes of actors and polycentricity have been investigated far less (Roe 20082009; Ostrom 2012; Bloor et al. 2013). Moreover, emission reduction in shipping has not been treated as an energy policy issue, even though uncertainties regarding fuel supply, distribution infrastructure and prices of fuels form the core of the matter for the shipping industry. We use the case of sulphur oxides (SOx) emissions in the Baltic Sea Region (BSR) in order to put these issues under social scientific scrutiny. The study aims at reconstructing the process of SOx emissions reduction in the BSR as a complex multi-stakeholder interaction by tracing the actors’ engagement in SOx emissions reduction policies in multiple contexts by using interactive governance approach (Kooiman 2003; Kooiman et al. 2008). It focuses on two interlinked empirical research questions: (1) How SOx emission reduction policies are being anticipated by maritime industry, in particular by Baltic ports and (2) How port adaptation strategies are tied in with Baltic local and energy contexts. The empirical investigation draws upon documentary material and applies the method of qualitative content analysis (Gläser and Laudel 2009). The sources used consist of materials from around the Baltic region, including Russia. Recent literature has emphasized the need for stronger empirical maritime governance, in particular focusing on uncovering the failure of hierarchical regulatory governance of shipping negative externalities and researching the practical impact of institutions (Ng et al. 2013). Acknowledging this need, this research aims to contribute to the discussion on maritime governance through a thorough empirical investigation which emphasizes why polycentricity needs to be taken into account when shipping is concerned. Taking into consideration the trans-boundary and globalized character of shipping industry, the paper aims to explain how the same universal international regulation produces varying governance patterns. The key argument is that globalized shipping industry is nevertheless locally and sectorally embedded. The structure of the paper is as follows: “Interactive governance approach and maritime governance” section introduces the interactive governance approach, "Data and method" section presents data and methods, "Analyzing governance: empirical research strategy" section explains the analytical strategy and operationalisation of the governance approach, "Case-study: Baltic ports in vessel SOx emission reduction" section elaborates on the analysis and its results, "Baltic ports: adapting to a complex environment" section discusses the results in the light of interactive governance approach, and "Conclusions" section concludes. Governance is a complex notion which allows for multiple interpretations. It has been conceptualized and analyzed as interaction (Kooiman 2003), multi-dimensional policy process (Hill and Hupe 2002), networks (Rhodes 1996), choice and implementation of instruments (Lascoumes and Le Gales 2007), dynamics between the structure and process (Börzel and Risse 2010), and discourse (Hajer 1995). Here we follow the interactive governance approach as elaborated by Kooiman (19932003), which is based on the assumption that ‘societies are governed by a combination of governing efforts’ (Kooiman et al. 2008:2) which reflect the multiplicity of societal responses to modern challenges. The interactive governance approach focuses on the occurrence of governing interactions “at different societal scales, from the local to the global and with overlapping, cross-cutting authorities and responsibilities” (Kooiman et al. 2008:2). It views governance as a variety of horizontal networks, as well as vertical arrangements between public and private entities (Kooiman 2003; Kooiman et al. 2008; Torfing et al. 2012). One of the key strengths of interactive governance is its attention to polycentricity, which raises questions of how power is being exercised by actors located at different places and jurisdictional levels, and how multiple centers of decision making independent of each other can coexist (Ostrom et al. 1961; Ostrom 2010). Polycentric institutional structures enable addressing environmental problems at multiple scales and in dynamic environments where adaption to change and uncertainty is crucial (Galaz et al. 2008; Moss 2012). In policy studies, an interactive governance approach has also been applied to clarify collaborative policymaking and participatory processes, “whereby government involves its citizens, social organisations, enterprises and other stakeholders in the early stages of public policymaking” (Edelenbos 19992004:111). Thematically, interactive governance has most widely been applied to the study of river and water management (e.g. Moss 2004; Jentoft 2007; Edelenbos et al. 2010). The study of the maritime emission reduction debate within an interactive governance perspective draws the researcher’s attention to (1) the multiplicity of actors, whose number, positions and other intrinsic characteristics are subject to empirical verification, rather than a theoretically predefined parameters; (2) the variety of governing interactions, where a set of allowable actions and their outcomes are constrained by conditions both internal and external to the process under scrutiny; (3) the role of both formal and informal institutions in structuring the process. An actor is defined as “a single individual or a group functioning as a corporate actor” (Ostrom 2011:12). In the process of social interaction, externalities may occur if some actors do not find it in their interest to take account of the consequences of their actions on others (Buchanan and Stubblebine 1962). Essentially, externalities point out to divergence between private and social costs. Institutions are regarded as ‘rules of the game’, representing formal rules and compliance procedures as well as agreed operating practices (informal rules) that structure the relationships between actors and socio-economic structures (North 1990; Scharpf 1997; Ng et al. 2013). Institutions influence actors’ decision making. The context is the set of regulatory, technological, social, political, environmental, territorial and economic conditions, in which the governance process takes place. Positionality refers to an actor’s relational position to space and time (Sheppard 2002). The interactive governance approach thus offers a framework for grasping the complexity of socio-political interaction in the emission reduction debate by focusing on how new forms of governance combine with traditional institutions and policy processes and how private actors can position themselves to sustain their position and create added value in the process of governance restructuring. The analysis focuses on actors who are involved, their strategic interaction, the multiple interconnected contexts in which interactions are embedded, and how institutions structure the interaction. Within maritime governance, the interactive governance approach is valuable in uncovering inconsistencies regarding interactive mechanisms, in particular by drawing attention to the interaction between the governing system and the subject-matter of governance (Kooiman 2003; Torfing et al. 2012). Tan (2006), Roe (20092013), Marsden and Rye (2010) have shown that traditional forms of maritime governance which rely on nested hierarchies are ill-suited to integrating environmental concerns. However, the creation of governance structures capable of reducing the negative impacts of maritime transport is not an easy process, as the emission regulation case of this paper demonstrates. In maritime transport, as in other multi-stakeholder environments, the regulation and management of environmental externalities often faces the ambiguities of governance architecture, creating situations in which small-scale problems are being approached from higher levels and attempts to tackle global problems are being undertaken at the lowest levels (Young 1994), thus creating problems of ‘fit’. A mismatch between the geographical extent of the emissions to be reduced and the territorial scope of the several institutional layers regulating maritime transports is notable in the case of sulphur emissions. Furthermore, a misfit between governance process and structure, differing understandings of the emission problem, limitations of available solutions and the actors’ capabilities to fulfill the requirements further complicate the situation. This study consists of an analytical investigation of governance changes brought about when new practices emerge in the industry, facilitated by new forms of regulation and a growing demand for higher environmental quality. The study is based on an analysis of qualitative data, carried out in order to explain how the ongoing process of air emission reduction in shipping changes maritime governance, especially with regard to shifting the position and action strategies of the ports. The data used stems from multiple sources: conference and seminar presentations, publicly available policy documents, industry statements (open letters, resolutions, press releases), news and statutory documents. Complementary to the ‘desktop study’ (Wheeler and Peszynska 2002), primary data was generated by the other author via participant observation and personal communication with maritime stakeholders in three events held in 2011–2012: 1) the Baltic Ports Conference Rostock, Germany 2011 (Baltic Ports Organization 2011), 2) the PENTA project workshop ‘Major shifts or business as usual? Implications of sulphur regulation on maritime transport’ held at Muuga, Estonia on 18.4.2012 (PENTA 2012), and 3) the CLEANSHIP Mid-Term Conference in Riga, Latvia 2012 (CLEANSHIP 2012). Various presentations in these events dealt with the policy process of the SOx regulation, estimates of how emission regulation will affect maritime transport flows and technology and how ships can comply with the regulations. By observing the discussions it was possible to obtain information on the reactions of the ports towards the emission regulation. This data in the form of field notes was used to complement written sources. In addition to the published and unpublished primary material, this study draws upon previous studies. Different types of data were nevertheless collected simultaneously (2012–2013). The mixed character of the data is a part of the complementary research design implemented in this study. Since any given type of data can give only certain kind of information, a combination of different types of data allows them to complement each other (Brewer and Hunter 2006; Small 2011). The qualitative analysis of the content was chosen as the central data analysis method and was applied coherently to all primary data generated in course of research (Gläser and Laudel 2009). The primary aim of the analysis is to look for mechanisms which can account for unfolding events observed in the data, and to clarify if the propositions created on the basis of governance theory are mirrored in stakeholder debates; i.e. if other actors and the ports themselves acknowledge their changing role in maritime governance. Technically, this method of analysis consists of the two distinct steps: data compression and pattern recognition. Firstly, the data collected for analysis is compressed in a tabular form in accordance with categories which can be viewed as ‘containers’ for meanings, deductively derived from the theory. Though the extraction process is theory-guided, it remains open to the new concepts emerging from the data. The dimensions of potential interaction to be explored are the subject of interaction with the nature of the situation and the scope of the included actors. In the extraction tables, the information is summarized for theoretical reasons, so that the background cases (units of observation) are left in the background, whereas the information is preserved. Information with the same meaning is aggregated, whereas contradictory information is kept for further in-depth investigation. Thus, single units of analysis data are aggregated into larger units (referred to as variables or categories) at a more abstract-theoretical level, which allows subsequent analysis. During the analysis of extracted information, attention is paid to patterns in the data, in particular (1) Sequences of events that occur more than once, (2) Combinations of conditions, processes or outcomes that occur more than once; (3) Conflicting accounts of events or processes. Pattern recognition is thus the second step of the analysis. Once patterns are identified, the results of the analysis can be visualized and presented in form of graphical displays, which are used to both describe and explain the patterns in the data (Miles and Huberman 1994). The extensive use of graphical displays firstly allows for the reduction of the data by selecting and transforming it through summarizing the argumentation lines, and secondly, reinforces the validity of research by assembling information contained in lengthy qualitative data in accordance with clear-cut rules (Miles and Huberman 1994:11). Finally, the construction of displays plays a substantial role in deductive qualitative analysis, not only by helping to organize the material, but also by adding an analytical level to the interpretation of the data and by transferring it a certain level of abstraction. The interactive governance approach offers a broad and inclusive framework well-suited to grasping the complexity of contemporary socio-political interaction in the field of public policy. The interactive approach to governance provides a researcher with the following conceptual guidelines: encouragement to look for actors and focus on their interactions in multiple institutional contexts (in which the interactions are embedded), as well as paying attention to how these contexts are interconnected (Kooiman 2003). The primary focus of the empirical investigation is on action, in that the data sources were used to extract information on the actors and the institutional contexts in which they interact, as well as the relationships between the actors and the contexts. Key questions included: Which actions are pursued, announced, desired, rejected, and intended? How is the modus of action embedded in contexts? For the purpose of empirical investigation, the theoretical concepts introduced in "Interactive governance approach and maritime governance" section were operationalised in the following way. An actor is described in two dimensions: type (individual, institution, public, business etc.) and position, in regard to governing interaction (rules demanders, suppliers and targets). In relation to action, the category of actor is seen as empirically opened up. Thus, any actor who acted in regard to the policy problem was regarded as relevant. Institutions are operationalised with the grammar of institutions developed by Crawford and Ostrom (1995). They distinguish between three types of institutions: rules, the most prescriptive and formal type of an institution; norms, which are also prescriptive but are not presupposing any formal punishment for non-compliance; and strategies, which do not contain normativity but rather describe common communication patterns. Institutional statements can be described in three dimensions: the subject of institutional statement (what is regulated), its content (how it is regulated), and scope (to whom it is applied). The elaboration of these three dimensions allows for depicting the interconnectedness of actors and institutions by showing how spatial and institutional contexts, related to regulatory, technological, social, political, economical, and environmental elements, affect actors’ behaviour. Institutional contexts exist simultaneously and overlap, thereby enabling some actions and putting constraints on others. Eventually, in relation to action, institutional contexts are characterized by two dimensions - opportunity and challenge - which describe the perceived influence of the ‘rules of the game’ on the potential outcomes of the process. In order to explain how Baltic ports are affected by the new regulations and how they adapt to these changes, the analysis cannot be reduced to the simplistic scheme of ‘regulator → regulated’, but must embrace the complexity of the process. The use of interactive governance as a research framework has several advantages in this respect. Firstly, it focuses on the empirical research into dynamic action (governing interaction) rather than static structures (government institutions). Secondly, it makes no normative assumptions about the actors, so that the scope of governing actors is defined empirically for each concrete case. Thirdly, it does not impose any methodological restrictions, being open to quantitative, formal and qualitative contributions alike. Finally, although the policy process in question can be formally regarded as a new regulation which targets vessels and requires them to technically adjust to the new sulphur exhaust limits, the interactive approach emphasizes the governance dimension of this process. At the same time, this analytical strategy is not without limitations. The concepts of the interactive governance approach offer a rather simplistic research model to deliver an analysis of this process, because in the actual process of SOx emissions reductions, all the dimensions of governance are interconnected and influence each other so that the causes and effects are often difficult to distinguish between. Thus no tools are provided for recognising the direction of causality and the actor-structure problem remains unresolved. The mechanisms associated with SOx emissions reduction, such as monitoring, certification, control and penalisation, as well as the provision of additional services, relies on multiple actors with different and often conflicting agendas. The logic of the interactive governance approach suggests that the question “Who is the governing actor?” is empirically open. The initial monitoring of the data showed that both public and private bodies consider their interests affected and therefore are concerned with the upcoming changes in shipping SOx emissions standards (Table 1). Additionally, the exploration focuses upon the actor’s position in governance interaction, distinguishing between rule-demanders, rule- suppliers and targets of rules (Buethe 2010). This framework allows for a systematic approach to identification of positions of governing actors. Importantly, it highlights the changing relationship between actors in the development of governance processes. Nation states are usually considered as the main rule-demanders, since they have representatives in the intergovernmental organizations (such as the International Maritime Organisation - IMO), through which they seek to formally regulate the negative environmental effects of shipping. In the Baltic Sea region, the Helsinki Commission (HELCOM) has a key role in environmental protection and policymaking through intergovernmental cooperation (Stankiewicz 2012), although bringing the divergent interests of the Baltic littoral states together is not always possible (Knutsen and Hassler 2011; Hassler 2011). The EU institutions (the European Commission and the European Parliament) are now increasingly active in demanding new environmental regulations as well as attempting to introduce rules for exceeding the level of demands posed by the states in the IMO debates. In EU policymaking, issues related to public health and the environment are lobbied for by the interest groups through the Directorate General Environment, although there are often conflicts of interest with the maritime and shipping industry, as represented through the Directorate General for Mobility and Transport (Pallis 2007). Thus, both intergovernmental organizations and EU institutions are arenas in which different interests within maritime transport meet each other. At the same time, the role of environmental NGOs, which played a prominent role in demanding new rules and regulations in other issue-areas, has been rather marginal in the maritime issues (Skovgaard 2012), especially concerning the SOx questions. The private actors can be expected to occupy the target-of-rules position in governance. In the Baltic Sea region, ship and cargo-owners and associations representing their interests continually complain about a sharp rise in vessel operation costs caused by the sulphur regulations (Sweco 2012; field notes). Also in the bunkering sector, especially in Russia, SOx regulation was received most negatively, due to fears of significant shrinkage of the market and loss of market shares (PortNews 2013). However, the Baltic maritime industry is not homogeneous in its reactions to SOx regulation. A small group of environmentally-minded ship owners (e.g. Wallenius Wilhelmsen, Maersk) have already adopted voluntary measures to implement new regulations in order to gain a positive image (Maersk 2011; Wallenius 2013). Others have started to invest in adaptation strategies well in advance; e.g. by transferring their vessels to liquefied natural gas (LNG) (Izvestiya 2012). Demand for additional measures comes also from a group of cargo-owners willing to transport their goods with a vessel which adheres to environmental quality standards. Since documentation from a classification society relates only to upholding the minimum standards, ship owners turn to ISO certification or private certification schemes to prove their environmental quality. In the BSR, one of the prominent voluntary certification schemes used for notifying environmental quality which goes beyond regulation is the Clean Shipping Index (CSI) (CSP 2012; Wuisan et al. 2012). The CSI was created to improve the environmental performance of maritime transport and to bring together like-minded vessel and cargo owners. After fulfilling the requirements of the Index, the vessel-owners receive authorization for their vessels from a classification society. Cargo-owners in turn can use the CSI members in their procurement of transport services, to assure their own customers that they only use companies with good environmental performance. In addition, a Clean Shipping Forum, which other supply chain actors such as freight forwarders and ports can join, has been created. Engaging in such schemes as CSI, ship and cargo owners change their position with regard to governance interaction. The interactive governance framework suggests that the institutional context shapes the governing interactions. Thus, it is beneficial to study how actors relate to the context. In order to analyzing the assumed actions and intentions of the actors, we relied on a broad desk-top study of publicly available materials to reconstruct the broad lines of the multiple contexts in which the debate on SOx unfolds. At this stage, qualitative content analysis allowed for identifying how the actors relate to the context and how the particularities of the context shape actors cost-and-benefit calculations with regard to the expected outcomes. When the research was consolidated, we recognized a need to enlarge the contextual analysis beyond the shipping arena and consider the regional governance patterns. In particular, we pinpointed the differences in debates on the SOx emissions which unfolded among the EU and Russian maritime stakeholders. The context of energy value chains and conflicting interests in the field of energy policy appeared very strong through the source materials. The IMO and the EU, the rule-suppliers regarding SOx emissions reduction, have moved forward with the issue with a different timetable and on a different geographical scale. The IMO Marine Environment Protection Committee adopted amendments to the MARPOL Annex VI regulations on sulphur oxide requiring a maximum 3.50% content by 1 January 2012 and 0.50%, by 1 January 2020 globally. As coming to an agreement on global SOx levels turned out problematic, sulphur emission control areas (SECAs) were formed. These consisted of: Baltic and North Sea, North American SECA and Japan-East Asia SECA. The transposition of provisions set under the IMO into the system of EU law has had important consequences. Firstly, the existence of an EU directive gives the Commission a degree of competence in this area, which means that the member States are supposed to give an agreed position at the IMO for all matters concerning the sulphur content in liquid fuels. Secondly, a directive is the most prescriptive instrument in the EU legislative tool-kit. It has the features of direct applicability and direct effect, making the implementation and enforcement more detailed and rigorous than the provisions of international law. Moreover, this directive is applicable on a territorial basis, so that any foreign vessel (i.e. not sailing one of the EU Member States flags) also falls under the scope of its provisions when entering the coastal waters and ports of the EU countries. Additionally, the geography of the Baltic Sea and its shipping routes make it practically impossible for vessels to avoid sailing in EU coastal waters, even if their target ports are located in Russia. Thus, the EU sulphur directive de facto has a wider scope (of actors included). Moreover, in the IMO, practices of lobbying for delays, individual opt-outs and special schedules are widespread, although the EU Commission has refused to revise the directive’s schedule. Finally, EU law adds a private liability dimension to IMO rules, whereas private entities cannot be penalized for non-compliance with IMO public international law. Furthermore, the EU decided to take additional actions and in its transposition set even tighter limits. The EU directive 1999/32 limited the ship fuel sulphur content to 0.1% in 2015 in the Baltic Sea and North Sea SECA area. Non-compliance with the directive is to be penalized by the national authorities. However, checks on the amount of fuel in ships were made very loosely, which raised concerns among NGOs that the failure to comply will not always be discovered (Transport and Environment. Newsroom 2012). These legal inconsistencies have direct implications for the functioning of ports. In compliance with MARPOL Annex VI a regulatory system based upon Air Pollution Prevention Certificates emerged. The Certificates are applied by shipping firms owning and/or operating vessels from respective national agencies (e.g. maritime administration), which verifies the compliance of vessels of its nationality with measures falling under the scope of air pollution reduction (engine modifications, supply of low-sulphur bunker etc.). Neither the IMO nor the EU regulations lay down detailed provisions on sulphur legislation enforcement. The states are responsible both as flag and port states for the successful implementation of the regulation. Thus, the role of inspector is reserved for ports, which in the framework of port State control (PSC) procedures verifies the vessel’s compliance based on the vessel’s certificate as prima face evidence. If a vessel is found to be non-compliant, compliance and enforcement mechanisms (e.g. reporting deficiencies, monetary penalties, the removal of certificates or documents of compliance) can be triggered. A similar situation emerges if a vessel chooses to adhere to the IMO sulphur regulations by installing a scrubber, which requires a retrofit plan, with deadlines and approval by class or flag state. Classification societies need to inspect a vessel and state whether the scrubber is fully functional. Thereafter, ports come into action, since the scrubber installation is monitored by PSC authorities during a PSC inspection. Therefore, controlling function of ports in respect to monitoring the implementation of sulphur fuel reduction (inspecting, sampling, prosecuting) is central, even though the regulatory environment is ambiguous in respect to implementation of this function. Even though air emissions represent only a part of the negative shipping externalities, the issue is significant for several reasons. The shipping industry accounts for approximately 10-15% of NOx (nitrogen oxides) and 4-9% of SOx emissions globally (Endresen et al. 2008). Sulphur in ship fuels lead to declining air quality, and creates negative health effects for humans and unwanted acidic loads in the environment. Sulphur in fuels is transformed into sulphur oxides after a burning process producing the key component of the particle matters (PM). Therefore, the regulation of the SOx content in a bunker is an effective way to contribute to limiting the adverse health effects of ship exhausts (Jalkanen et al. 2009). The concerns related to the negative effects of sulphur emissions on public health and the deterioration of the marine and coastal environment were, for the regional maritime stakeholders, the main reason for bringing the vessel fuel issue into the realm of public policy. At the same time, many indicated that the decision to introduce regulation was premature and warned of the potential negative environmental effects connected to modal shifts from sea to rail and road (field notes). The choices regarding fuel vessel use is a significant driving force for changing future transport flows because fuel costs represents between 45 to 55% of the daily operational costs of vessels. The proposed SOx regulations are expected to raise the costs of shipping between 30 to 50% (Kalli et al. 2009; EMSA 2010). Ship and cargo-owners and their associations point out that, as a result of SOx regulations, freight prices will increase; since additional costs will be allocated to charter parties. Export industries particularly fear a significant increase in sea freight prices (with up to 1.2 billion Euro additional costs per year), which in turn can negatively affect their competitiveness. Many industry associations have lobbied to postpone the introduction of stricter sulphur emission standards by 5 to 10 years (Sweco 2012; Forest Industries, Swedish Forest Industries Federation 2012; EK 2011). Ship and cargo owners expressed objections towards the EU Sulphur Directive 2012/33/EU because it sets tighter limits for vessels operating inside the IMO SECA areas as compared to other waters under the jurisdiction of EU member states, creating an uneven playing field within the EU. They proposed that either another SECA should be formed to cover the Mediterranean Sea, or that, alternatively, compensation measures should be offered for those vessels operating inside the presently established SECAs in order to equalize the differences in operation costs (CEPI 2012; Maritime 2012; Yle Uutiset 2012). Also, in the bunkering sector, serious concerns were shown, in particular by the Russian bunkering industry. In 2011 the Russian Association of Marine and River Bunkerers held an annual forum, in which a petition was prepared and later sent to the Russian Prime Minister Medvedev, in order to draw the attention of the federal government to ‘Problem 2015′ (SRO RAMRB 2012). The main concerns of the bunkering industry are (1) the inability to supply a sufficient amount of compliant fuel due to lack of necessary refinement capabilities in the Russian oil industry; (2) the shrinkage of the bunker market, particularly of the transit bunkering segment; (3) the absence of standards, equipment and infrastructure for a wide introduction of LNG bunkering in Russian ports. The main competitive advantage of the Russian bunkering market has been lower prices for heavy fuel oil (HFO), which created a constant growth of ca. 10% due to a gradual increase in transit bunkering. As regards new sulphur regulations, the bunkering industry appealed to both rising costs connected to adjustment (modernization of old and acquisition of new equipment for refining and bunkering), decreasing incomes connected to loss of competitiveness with foreign companies, and a drop in number of vessels bunkering in Russian ports. In the worst case scenario, the prognosis for Russian bunkering market shrinkage is up to 40% (Morskoy 2012b; Morskoy 2012d). The Russian ship owners fear that they will have to use more expensive low-sulphur fuel due to the absence of sufficient LNG infrastructure (Morskoy 2012b). At the same time, the Bunkering association recognized the perspective of LNG bunkering development as a long-term opportunity. Finally, due to changes in the operational environment (rising freight prices, modal shift, fuel shortages, lack of infrastructure), the traffic patterns in many ports are expected to change. In particular, the small and middle-sized ports positioned within the Baltic SECA are afraid of losing traffic, their main source of earnings, because growing maritime transportation costs could increase cargo transports on land or cause the re-routing of cargo to ports outside the SECA area (PortStrategy 2011). Russian ports which now enjoy a higher number of transit ship calls visiting for bunkering purposes are also worried about losing their traffic (PortNews 2013). As ports with bigger volumes are in a better position in terms of market shares and are more attractive for investments, from the smaller ports’ perspective the new tighter environmental regulation will only enforce the on-going trend towards larger ports by eradicating the small ports. Currently there are three technical ways a vessel can fulfill the proposed emission limits: (1) by using fuels with a reduced sulphur content (marine gas oil (MGO) or marine diesel oil (MDO)), (2) installation of a scrubber (exhaust gas cleaning system) to a vessel, or (3) conversion of a vessel so that the use of liquefied natural gas (LNG) or other alternative fuels is possible (Kalli et al. 2009; EMSA 2010; Bengtson et al. 2011; Stenhede 2012). However, all these options have technical and/or financial limitations. MGO/MDO is already available, but many ship owners restrain from using it due to its higher price. Additionally when NOx standards come into force, the ship owners who chose this alternative will need a new round of adjustment measures. With a scrubber, a vessel can continue to use high sulphur bunker, but a scrubber costs several million euros and installation is not technically possible for all vessel types. Scrubbers also produce sludge and washing waters that cannot be put into the Balticsea. Ports thus need to have reception facilities for this material from vessels (Kalli et al. 2009; Wärtsilä 2010). Even though the suppliers of the scrubbers are very optimistic regarding the effectiveness of their technology, in the opinion of the ship owners/operators the scrubbers currently offered on the market are not reliable enough to meet the emission standards (field notes CLEANSHIP 2012: Hoenders’ verbal communication 20.9.2012, Morskoy2012a). The use of LNG can solve many environmental problems, as it naturally contains no sulphur and the emission caused by LNG used as a fuel are lower compared to other fuels (EMSA 2010). However, LNG is not a panacea either: vessels need to be converted and terminals suitable for LNG bunkering are required. Also the lack of operational standards produces multiple safety, security and environmental concerns, hindering LNG usage (Aagesen 2012). Thus, what investments into infrastructure and facilities will be needed in terms of port adaptation is yet unclear. Shipbuilding industry, manufacturers and suppliers of scrubber technology, as well as producers and suppliers of new marine fuels all have the knowledge to support emission reductions from the technical side, i.e. they possess the expertise necessary to create realistic and efficient rules. At the same time, these actors all have market interests at stake: new SOx standards mean increasing business opportunities for them – and increasing competition. Whereas the introduction of SOx regulation brings the ports new responsibilities as rule-suppliers since the responsibility to monitor and control compliance is held by the port state authorities, it also makes ports to a target for rules about infra- and superstructure development and maintenance. Ports become responsible for enabling cleaner operations via the establishment and maintenance of reception facilities (for scrubber wastewaters and sludge), LNG infrastructure (storages, bunkering terminals) and shore-side electricity facilities. For many Baltic ports and their associations, these changes constitute a major concern (Holma and Kajander 2012), since long-term investment decisions in which ports are dependent on the choices of other actors need to be made. The regional governance context adds an important dimension to our understanding of the Baltic ports’ operational environment. The SOx emission reduction has an immediate connection with the energy policy agenda, since it directly concerns energy efficiency, the choice of fuels and their supply. In particular, the question of fuel availability and price poses challenges to ship owners, who have to adjust their vessels and ensure compliance with new exhaust standards. Which adjustment alternative will turn out to be the best economic solution depends on the disposition of forces in Baltic energy markets. So, besides the economic costs, the political costs of adaptation need to be accounted for. In the Baltic Sea Region, energy questions are high on the political agenda. Thus, the patterns of Baltic regional governance necessarily influence the port adaptation strategies in the SOx emission reduction process. The recent development of the system of Baltic maritime governance was marked by EU attempt to widen its influence in international maritime affairs (Gritsenko 2013). The proliferating EU competences (as in case with the Sulphur Directive) put limitations on the strategies available to the Russian maritime industry. In particular, the Russian bunkering market is concerned about consequences of SOx regulation. Each of the technological options required to meet the SOx requirements has a different meaning for the bunkering market. If the ship owners choose the MDO/MGO option, the bunkering companies need to increase their supply of these fuels. Bunkering constitutes 0.3-0.5% of Russian GDP. Nearly 80% of the fuel supply is HFO, which for some companies consists of 90-95% of their portfolio (Morskoy 2012b; Morskoy 2012d). Although up to 70% of the fuels the Russian bunkering companies supply to the BSR are bunkers with low-sulphur content (1%), this fuel will not be useable when the 0.1% limit comes into force in 2015. Currently these companies do not offer any fuel which is near the 0.1% limit, so a switch to MGO/MDO is unavoidable. The majority, ca. 70% (Morskoy 2012b) of Russian bunker suppliers are daughter companies of vertically integrated oil and gas companies, including Rosneft and RN-Bunker, Gazprom and GazpromNeft Marine Bunker, Lukoil and LUKOIL-Bunker, as well as the pipeline companies Transneft and Transneft-Servis. The rest consist of smaller independent bunkering companies (e.g. Baltic Fuel Company, Baltiyskaya Toplivnaya Kompaniya) which buy fuel from oil majors instead of producing it themselves. Thus, the dominant Russian bunkering companies, which are bound to their own production schedules, have started to produce marine diesel oil, which requires costly investment in the refinery and production processes. Eventually, maritime stakeholders assume upcoming modal shifts due to shortage of compliant fuels and/or rising fuel prices in Russian ports. In case scrubber technology is chosen, Russian bunker companies and the oil industry can proceed with a ‘business as usual’ scenario, in which they are capable of supplying HFO at competitive prices. However, they cannot assess the scrubber option as the ‘first-choice’ alternative due to multiple technical issues which still remain unsolved (Izvestiya 2012). As for the LNG option, the opinions in Russian maritime sectors are divided: some see it as the future alternative (Izvestiya 2012; Morskoy 2012a), some are sceptical due to the required infrastructure investment (Morskoy 2012ab; Morskaya 2011). The EU is widely supporting and developing the idea of LNG-fueled European fleet (European Commission 2013). Russian gas supply capabilities are excellent, so the interests of the EU and Russian LNG suppliers meet. However, extensive use of LNG requires development of (1) a regulatory basis for LNG use; (2) new building and retrofitting; (3) LNG infrastructure (production, storage, bunkering terminals etc.) which are all costly procedures and will take a long time to implement (Morskoy 2012c SRO RAMRB 2012; Morskoy 2012b). In this case, the EU will have a competitive advantage. Statoil is leading the Nordic market for LNG bunkering, while many liquefying facilities are situated in Europe, so that Russian gas transported via pipelines can be liquefied and supplied as fuel by European producers. Since the Russian gas industry is monopolized by the state-owned Gazprom, Russian ports are afraid of losing their traffic in case the federal state will not help them to adjust, modernize and develop costly LNG infrastructure (Morskoy 2012c). Another solution for Russian ports would be to engage in closer cooperation with the EU partners to ensure sound development of LNG facilities. The economic viability of this solution can be undermined by the political situation, since it touches upon the sensitive field of EU-Russian energy relations. Thus, the advances in Baltic maritime governance are closely bound to the broader agenda of EU-RF relations (Gritsenko 2013). Though SOx regulation targets vessels, our analysis has shown that, in the emission reduction process, the role of the Baltic ports will change. The ports will gain new controlling functions, but new operational requirements will also be imposed. Stevedore companies, ship and cargo owners, port service providers, bunkering companies and other actors interact and carry out their operations within a port. On behalf of the ports, the tightening of environmental regulations is a threat to competitiveness. Before a port can become an enabling environment for environmental shipping, the required port infrastructure has to be built. In order to finance such changes, ship-owners (via duties and fees) can be involved, or ports can invest their own resources or find investors among the third parties (nation states, EU funds, private investors). However, whereas larger ports might have more resources to pay for new facilities and better opportunities to manage co-financed schemes, smaller ports often lack resources and feel that their competitiveness is threatened. Many operators of small and medium sized ports are thus worried, because the operational costs of shipping are constantly increasing, while earnings are not (Stubbe 2012). Whereas some ports have concerns about their survival after 2015 when the IMO sulphur regulation enters into force, and are trying to calculate what it would mean for their traffic volumes, other ports in the BSR have actively started looking for available options. Examples include collaborative agreements between ports to ensure cleaner shipping. The Ports of Stockholm and the Port of Helsinki have cooperated in environmental issues since 2009. The Ports of Stockholm and the Port of Turku signed a collaborative agreement in 2011 to improve the environment in the Baltic Sea. The ports collaborate in facilitating the use of LNG for vessel fuel and for enabling LNG bunkering in both ports, by investigating the possibilities of supply electricity from the shore to more vessels operating with frequent liner schedules, and the management of grey and black water (The Ports of Stockholm 2011). All three ports (Stockholm, Helsinki and Turku) share the same shipping lines. By collaborating with the shipping line, the ports made preparations for the new vessel ‘Grace’, which uses LNG. The vessel started sailing on the Turku-Stockholm route in January 2013 (Viking Line 2013ab). Other examples include the establishment of collaborative networks. Currently, nine Baltic ports (Aarhus, Helsingborg, Helsinki, Malmö-Copenhagen, Tallinn, Turku, Stockholm, Sczcecin-Zwinoujscie and Riga) together with ship owners, LNG companies, national port organisations and European Seaports Organisation (ESPO) work together to enable LNG bunkering for vessels in the Baltic ports (TEN-T EA, Trans-European Transport Network Executive Agency 2012).This project highlights the facilitating role of ports in shipping governance process: the ports facilitate the investment, give land and make the necessary investments for the vessels (e.g. new quays). The port authorities also make a concession with a gas infrastructure company/gas operator to build and operate the LNG terminal. The project is TEN-T funded (Oldakowski 2012). New shipping environmental standards can also bring business opportunities to ports. By virtue of their connectivity function, ports occupy a unique position precisely due to the fact that they constitute governance arenas which are inhabited by a large number of actors involved in transport and supply chains. This opens up possibilities of stewardship, new leadership and reputational gains. While tightening environmental regulation is currently seen as a threat to connectivity, it can also be a source of competitive advantage. Some shipping companies and cargo owners have already realized this, with regard to the increasing adoption of voluntary regulations such as the Clean Shipping Index (CSP 2012; Wuisan et al. 2012). Broadening the range of stakeholders and explicating the responsible parties (not only in terms of liability, but also in terms of responsibility) would change maritime transport and deliver clean and efficient solutions within the global supply chain (Ponte and Gibbon 2006; Lloyd’s Register 2011; Pike et al. 2011). Ports cannot be considered as ‘newcomers’ in the domain of shipping externalities governance, given their role in monitoring and control granted by the PSC mechanism. However, the governance of shipping externalities is becoming a polycentric and multi-leveled process, which requires venues where actors can meet communicate and create structures in which different governance mechanisms can complement each other. This strengthens the role of ports as a place (Olivier and Slack 2006; Verhoeven 2010) which can naturally offer themselves as venues due to their physical properties (prominently as waterfronts and logistic nodes) as well as their environmental stewardship in the course of the greening of maritime sector. On the other hand, this requires ports to adapt new strategies, which will allow them to function in a situation of multiple conflicting contexts, which can create uncertainties in their operational environment. The first empirical research questions asked how SOx emission reduction policies are being anticipated by maritime industry, in particular by the Baltic ports. On the basis of our analysis, we defined two strategies which Baltic ports are likely to adopt in order to adjust to upcoming changes: (1) preventing loss of traffic by creating compliance-friendly infrastructures (ports themselves bear the cost of adaptation or find external investment); (2) raising the attractiveness of shipping as environmentally-friendly transport (e.g., in the light of CSR, cost of adaptation is transferred on the other actors) (Figure 1, right hand side). These strategies are not universal, but constitute responses to the possible future scenarios (chains of events expected to happen) emerging in the process of multi-stakeholder interaction and shaping ports’ operational environment. As demonstrated above, when pursuing these strategies, ports can act as environmental leaders to promote change, as coordinators of multi-stakeholder processes, as well as cooperating with other ports. Baltic ports: adapting to a complex environment. The ‘mind-map’ of the stakeholders’ debate on the SOx reduction process presents their views of the process, mapping conflicting contexts in terms of opportunities and threats (Figure 1, left hand side). This brings together the analysis of governing actors, institutions, which structure their interaction, and conflicts between the different institutional contexts, within which the SOx debate unfolds. At the initial stage, most actors feared the upcoming changes. However, these changes do not necessarily have a negative impact on the maritime sector, or on the competitiveness and connectivity of ports. Changes occurring in ports, along with the proliferation of SOx emission reduction procedures, illustrate how these concerns are anticipated in the BSR. The second empirical research question seeks to clarify how port adaptation strategies are tied in with Baltic local and energy contexts. At the same time, the strategies described above include benefits and challenges which are inherently connected to the broader socio-political context of the BSR. Within the Baltic Sea region, there is still an East–west divide regarding the actors’ willingness and capacity to take on environmentally related investments. For example, public awareness about forming political attitudes and consumer pressure demands that such investments are higher in the Nordic countries and Germany compared to the Baltic States or Poland. Germany and Nordic countries also have longer history of implemented policies integrating environment and economic investments, and an indication of this is eco-innovation performance (Weber et al. 2012). Practically-oriented projects between ports could diminish this divide by facilitating best practices. Secondly, we need to account for energy issues: also emission reduction from shipping is a question of energy policy, which requires choice and changes in the energy markets. This means that the vulnerable energy policy balance in the BSR, which is dominated by the EU-RF relation in this area, also has to be taken into account. 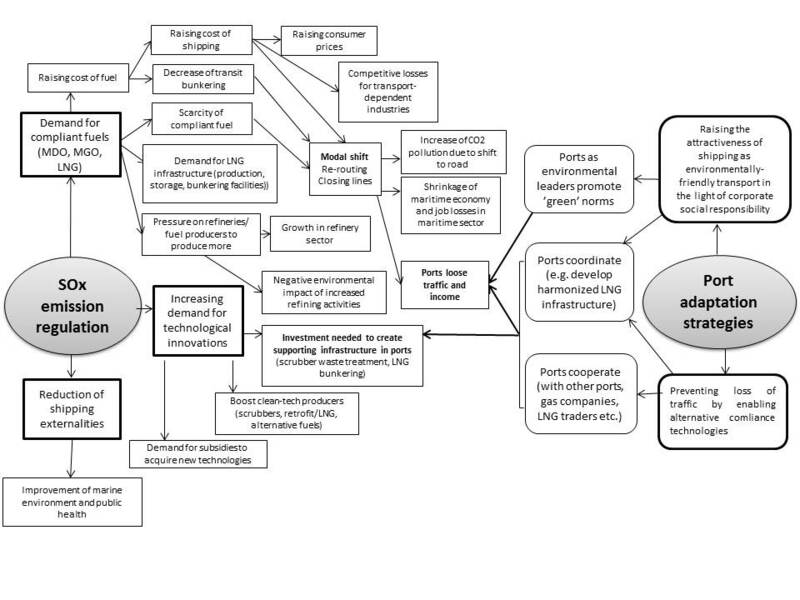 As the Figure 1 indicates, the interaction of multiple stakeholders defines the structure of the ports’ operational environment, which in turn influences the positions the ports assume in the governance process, and also defines their alternatives against the overall cost-opportunity structure. Moreover, the process is nested within the wider patterns of regional governance. The ports’ adaptation strategies in the Baltic do not necessarily reflect the alternatives, which will be met by ports in other regions. Taking into consideration the transboundary and globalized character of the modern maritime industry, our results show how different governance patterns may emerge in different regions with regard to the same ‘universal’ international regulations. This again explains why the hierarchical regulatory governance of shipping through negative externalities fails and why polycentricity needs to be taken into account when shipping is concerned. Using an interactive governance approach, this study has reconstructed the process of SOx emissions reduction in the Baltic Sea region as a complex multi-stakeholder interaction. In particular, it has paid attention to how governing interactions are embedded within local socio-political and energy contexts. The empirical investigation has demonstrated that the adaptation process is not limited to developing governance mechanisms capable of incorporating technical solutions in order to reduce negative impacts. Adapting to the changes in their operational environment, actors pursued new strategies, defined new rules and norms, but also reinterpreted the old institutions to reinforce their governance positions. This explains how seemingly universal international maritime regulations can produce varying patterns of governance. Observing the process of adaptation of the Baltic ports, this article highlights the importance of how to create governance structures capable of reducing the institutional ambiguities and resolving the problems of collective action. The case study showed the major limitation of a ‘technological fix’ – its ignorance regarding the divergent interests of multiple actors at different levels and scales – which dismisses SOx emissions from any other policy arena rather than pollution reduction. However, the issue of low-sulphur shipping appears far more complex, since no single actor has the full authority and capability to implement it. The mechanisms which are activated to limit the SOx emissions from seagoing vessels, such as monitoring, certification, control and penalization, as well as service-provision, rely on multiple actors with different and conflicting agendas, which are disseminated within the polycentric shipping governance arena. Thus, the article claims that globalized shipping industry is inherently polycentric and that the local and sectoral embeddedness of these multiple centers of authority needs to be taken into account. As the analysis through the interactive governance approach reveals, low-sulphur shipping challenges the traditional forms of port involvement in shipping governance, requiring changes in port administration and management. The introduction of SOx regulation broadens the ways in which of stakeholders are affected by the changes in shipping standards. However, this de facto change was not structurally anticipated by the introduction of comprehensive strategies for the management of shipping practices. Thus, many actors were forced into creating ad hoc and temporary solutions. Given the high degree of interdependence between the optimal strategies, the operational context has remained uncertain. The lack of clarity in terms of SOx adaptation strategies not only has economic but also political consequences, which have to be taken into account when planning how to transfer to zero-waste zero-emission shipping. In this study, we particularly suggest paying more attention to the position of ports in the process and their potential role in reducing the ambiguities and resolving the problems of collective action. This research was supported by the Finnish Doctoral Programme for Russian and East European Studies (Aleksanteri Institute/University of Helsinki) and University of Turku, Centre for Maritime Studies. The publication was granted by the Academy of Finland project “CHIP – clean shipping economics – shipping under the new paradigm” (decision number 257968) and project PENTAHLON – Ports of Stockholm, Helsinki, Tallinn, Turku and Naantali -together. The PENTATHLON project is financed by the Central Baltic INTERREG IV A Programme 2007-2013 of the European Union Regional Development Fund, the Ports of Stockholm, the Port of Helsinki, the Port of Turku, the Port of Naantali and the Estonian government. The article reflects the view of the authors. The Managing Authority of the INTERREG Central Baltic IV A Programme or the other oraginisations involved cannot be held liable for the information published in this article. The authors would like to thank two anonymous reviewers for their helpful comments. The article is based on joint work of the authors DG and JYP. Both authors have read and approved the final manuscript.